Kristina Hammond didn't just land a much desired lab position with Joy O'Keefe and a master's degree in biology by coming to Indiana State University. The 2013 graduate found a continued opportunity to contribute to the science behind the endangered Indiana bat when she joined Joy O'Keefe, assistant professor of biology and director of Indiana State's Center for Bat Research, Outreach and Conservation, and Steve Aldrich, associate professor of earth and environmental systems at Indiana State, to study safe havens for Indiana bats in the southern Appalachian Mountains. "Prior to (our research), the majority of the published work on Indiana bat habitat modeling focused on the Midwestern U.S., which could bias policies for the species in other regions," said Hammond, a biologist with Western Ecosystems Technology Inc. in Cheyenne, Wyoming. 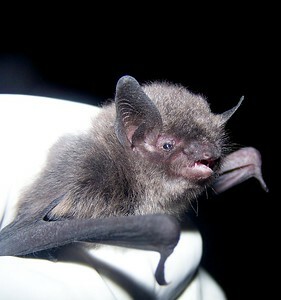 Their research, which predicted possible roosting habitat in the southern Appalachians, was included in the article, "A Presence-only Model of Suitable Roosting Habitat for the Endangered Indiana Bat in the Southern Appalachians," and published by the Public Library of Science - a nonprofit, open access publisher, innovator and advocacy organization. A Vermont native with an undergraduate degree in wildlife management from the University of Wyoming, Hammond met and learned about O'Keefe's research and lab at Indiana State during a Bat Blitz in Georgia in 2010. "I was drawn to Dr. O'Keefe's lab due to the high quality of work she produces, her love of procedure and protocol and the level of field work that would be required," she said. "We discussed the potential of me applying for an upcoming graduate position in her lab studying Indiana bats. After the bat blitz, Dr. O'Keefe contacted my references and offered me a position in the lab as a master's student. 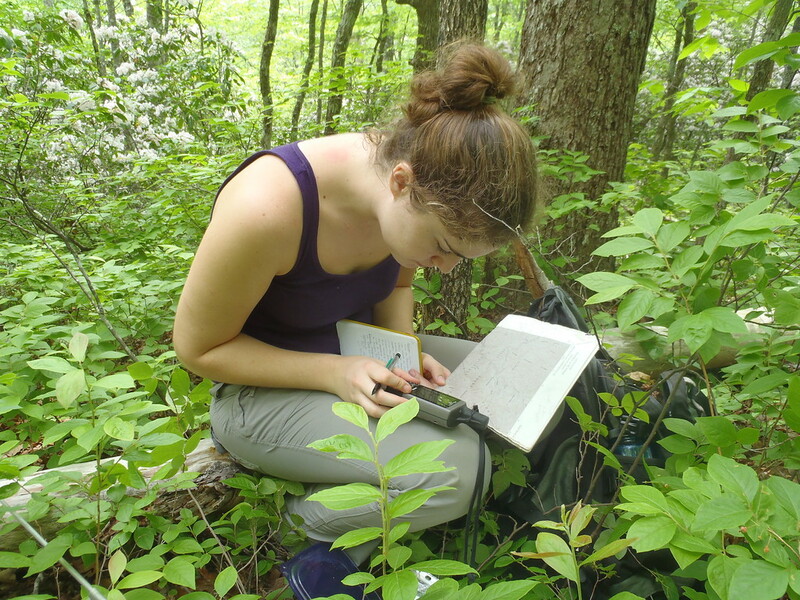 The position was unique in that, besides my own research, I would be helping continue Dr. O'Keefe's research that had already been going on for several years as part of a joint project with multiple groups in the southern Appalachians." O'Keefe conducted her own graduate work in western North Carolina, during which she was offered a contract with the Cherokee Indians to survey bats on their land. There, she caught Indiana bats, which are federally-endangered. The species was first discovered in Indiana in 1928, but have a much larger range beyond Indiana. "When I started studying bats in the mountains of North Carolina, there wasn't much known about Indiana bats in the southern Appalachians," O'Keefe said. "After I caught bats on the Cherokee Indian land in 2007, I then conducted a larger scale survey from 2008 to 2012 to better document their distribution and ecology in the mountains." O'Keefe discovered through her research that Indiana bats were drawn to roost in the dead trees in pine-hardwood forests. "That's interesting information for resource managers in that part of the country because they use prescribed fire to try to restore those pine forests," she said. "In the absence of fire, the forest shifts to more of a complex of fire-intolerant trees, like maple and poplar. Agencies like the U.S. Forest Service and the National Park Service use fire as a management tool and are interested that we found Indiana bats using pine-hardwood forests." O'Keefe thought it would be a good idea to create a predictive model that would indicate where the endangered bat would be likely to roost, so O'Keefe brought Hammond to work in her lab at Indiana State in January 2011. Their field research capturing and tracking Indiana bats in the southern Appalachians continued through the fall of 2012. "Once a bat was tracked to a roost tree, we collected high resolution data on the location of the roost tree and other measurements describing the tree and surrounding stand," Hammond said. "I then worked closely with Dr. Aldrich to create ArcGIS layers of various environmental variables within our study area such as aspect, slope, elevation and distance to water and then using our location data modeled what environmental variables were important to roosting habitat in the presence-only modeling program MaxENT." Between 2008 and 2012, 48 Indiana bats were tracked to 76 roosts within the study area in the southern Appalachian Mountains of southeast Tennessee and southwest North Carolina in the Cherokee National Forest, Nantahala National Forest, and the Great Smoky Mountains National Park, a region where Indiana bats have been observed since 1999. Hammond and O'Keefe discovered that the Indiana bats typically roost under sloughing bark from dead trees, particularly large diameter yellow pine or white pine snags of moderate height with low canopy closures. They also found that Indiana bat roosting habitats are most likely to occur on south facing slope in pine component forests at a certain elevation within the study area. "People from Tennessee, Georgia and Alabama are starting to find Indiana bats in new areas where they were not know to occur, so federal biologists have been able to take Kristina's model and use it as a base for creating predictive models in those areas" said O'Keefe, who is also studying the impacts of fire on Indiana bat habitats." I'm hopeful this will provide some predictive power to people working in areas where Indiana bats are understudied or not well-known, and I hope the way that we approached the modeling effort will be extended to create even more predictive models for other bat species in the U.S."
"Beyond what we learned from the model, I learned a large amount about Indiana bat ecology, crew management, and was exposed to a variety of other professionals from various agencies and groups, many of which I now work with on a professional level," Hammond said. The research was funded by the Joint Fire Science Program, U.S. Department of Agriculture Forest Service, Indiana Space Grant Consortium, the Tallassee Fund, National Park Service, North Carolina Wildlife Resources Commission, Tennessee Wildlife Resources Agency and the Eastern Band of Cherokee Indians. Photo: https://photos.smugmug.com/Other/Media-Services/Submitted-Photos/Staff-Uploads/i-ZWpCqZF/0/XL/bats1-XL.jpg - Indiana State graduate Kristina Hammond collectis field data while studying Indiana bats in Appalachian Mountains with Joy O'Keefe, assistant professor of biology and director of Indiana State's Center for Bat Research, Outreach and Conservation, and Steve Aldrich, associate professor of earth and environmental systems at Indiana State. 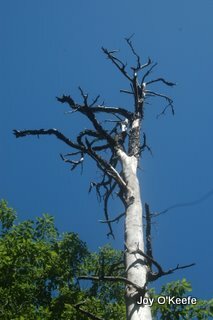 Photo: https://photos.smugmug.com/Other/Media-Services/Submitted-Photos/Staff-Uploads/i-R6dhB2J/0/O/bats2.jpg - Photo of a table mountain pine tree that serves as an Indiana bat roost tree. Their research predicting possible roosting habitat in the southern Appalachians was published by the Public Library of Science - a nonprofit, open access publisher, innovator and advocacy organization.